Some things will always be the same in every Charles Tyrwhitt suit. The elegant cut, sound stitching and flawless finish won’t change from one suit to the next. But it’s the way in which the fabric is woven that can create nuances in style, texture and weight. When a gent is choosing a suit, it’s just as important to consider the weave as it is to look at the color, pattern and fit, to ensure that you take home a suit that’s perfect for you in every way. Read on for an introduction to our most popular and elegant suit weaves. We use a variety of weaves across the Tyrwhitt suit ranges. Here are some of our favorites. 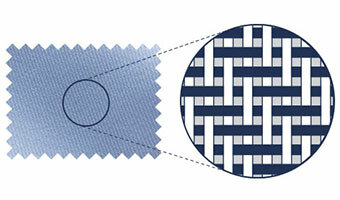 Twill weaves have a distinctive diagonal pattern created by the way the vertical and horizontal threads are offset when they are woven. Because it’s so simple and sturdy, twill is often used for suits, blazers and coats, and you’ll see it often on the high street. 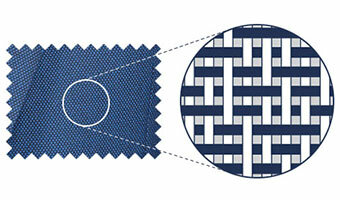 The characteristic slant of the pattern is most recognisable in fabrics like denim and chinos. Sharkskin is a crisp weave composed of closely-woven fine worsted yarn in a subtle diagonal pattern. Sophisticated and classy, sharkskin suits were traditionally the domain of high flying lawyers and advertising executives, but these days the look is at home in any business or formal setting. 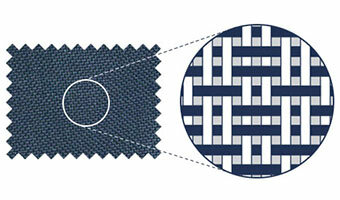 Hopsack is a plain weave that uses thicker or multiple yarns to create a textured, square-looking pattern. Because it’s slightly more open than other plain weaves, hopsack is wonderfully breathable and comfortable to wear all year round. 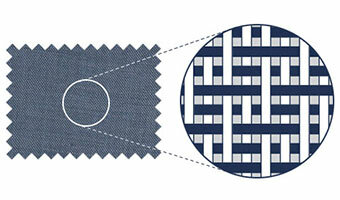 Birdseye is a traditional suiting fabric consisting of very small uniform spots. The weave looks plain from a distance, but up close the delightful detail of the spots is revealed. Because the pattern is so subtle, birdseye is perfect for gents who are keen to add a touch of understated flair to their suits.